Although Russia may not suffer as much as the rest of the world, expect lower rates of growth as the economy searches for new ways to grow. Russian financial analysts believe that 2012 is shaping up to be even more difficult than the year that just ended. Economic problems persist in Europe and the United States, and even China is starting to show signs of a slowdown. And even if rumors of another global recession are premature, analysts say that the Russian economy is unlikely to maintain its growth. According to Troika Dialog strategist Chris Weafer, like 2011, 2012 will get off to a rough start, but improve in the second half of the year. Vladimir Tikhomirov of Otrikitie Financial Corporation agrees. He has suggested that the first months of this year will be impacted by Europe’s ongoing struggle to find a way out of its debt crisis, which will impact both investor sentiment and oil prices. Tikhomirov predicted that in the first half of 2012, the price of oil will drop below $100 a barrel. Yulia Tseplyaeva of BNP Paribas further predicted that in the first quarter of 2012, the euro will reach a new low against the dollar and along with it, the ruble exchange rate. Against this background and in view of the presidential elections, in the first quarter, the exchange rate may drop to 32-33 rubles per $1 according to Ivan Chakar of Renaissance Capital. But then the situation will begin to improve. Analysts are betting that European politicians will be able to find a way out of the crisis and that the eurozone will not fall apart. Weafer also believes that China will also cease to be a cause for concern; it will be able to gently ground its economy to preserve stability ahead of an expected change in leadership this fall. Tikhomirov believes that Russia’s economy will stabilize after the March presidential elections and Tseplayeva agrees: “With the end of political instability, repatriation of capital will begin, which, coupled with rising oil prices – up to $120/barrel by the end of the year – will strengthen the ruble to 28.55 per $1,” she said. But others are not so optimistic. Alexei Moiseev of VTB Capital believes that early in the year, the European Central Bank will start large-scale quantitative easing, and if this is not successful, then another round of quantitative easing will be led by the U.S. The resulting monetary deluge would help the ruble: “We expect a strengthening of up to 28-29 rubles per $1 in the first half of the year, then a seasonal rollback,” Moiseev said. However, Yevgeny Gavrilenkov of Troika Dialog warned that in 2012, Russian companies and banks have to pay about $75 billion in external debt––less than in 2011, but comparable to the expected current account surplus. If global problems persist and debt refinancing continues to be difficult, then the ruble will weaken as foreign currency earnings go to debt servicing. So according to him, a rate of 33-34 rubles per $1 by the end of the year should not come a surprise. What everyone is sure of is that the exchange rate will fluctuate more much strongly. 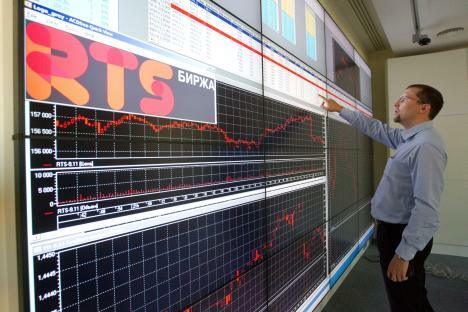 “The ruble will fall and rise – and many times,” said Ksenia Yudaeva of Sberbank. It may be impossible for analysts to agree on a forecast for the ruble, but there is a consensus on GDP growth. Most analysts approve of the expectations of the Ministry of Economic Development, which has forecast that economic growth will slow to 3.7 percent. The Russian economy has lost its pre-crisis growth drivers and the factors that drove growth in 2011 - post-crisis recovery of production sector stocks, rapid credit growth, and a powerful increase in agricultural ouput – are unlikely to work in 2012. Unemployment has almost reached pre-crisis levels, as has capacity utilization. In December, companies reported an increase in excess overhang compared to capacity demand and an intention to cut personnel in 2012. The stagnation in demand while excess capacity grows also indicates that investment activity in the industry is unlikely to increase. In 2011, about 60 percent of GDP growth was financed by bank loans––the same as it was at the height of economic overheating in 2007, while on the average the 10-year credit resources ensured approximately 30 percent growth, said Natalia Orlova of Alfa-Bank. This heavy credit leverage weight should decline, which will slow the pace of GDP growth to 2.6 percent, she said.